Donuts aren’t meant to be enjoyed before brandy and cigars, they’re not meant to be placed on a specialized plate, or eaten with a certain fork just so. Donuts are…well…they’re fried dough, and even though they’ve been having a bit of a make-over lately (crème brûlée donuts come to mind), they are the people’s food. A populist dessert/snack/breakfast thing. And the Spanish, to my mind, invented the best iteration of the donut: the churro. The origin of the churro is as murky as the water in a theme park log ride (maybe a modification of Chinese pastries, or even a quick and easy non baked pastry for Spanish shepherds), but their mass appeal is apparent, and you can’t walk two feet into an amusement park without the smell of oil and cinnamon sugar tickling your nostrils. 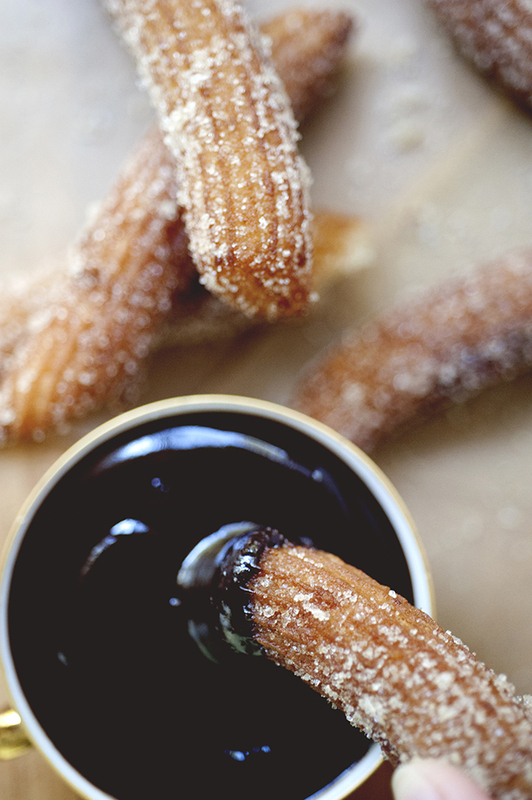 We know churros as the foot and a half long things children munch on with sticky fingers at carnivals, but the true version of a churro is a little bit more refined. 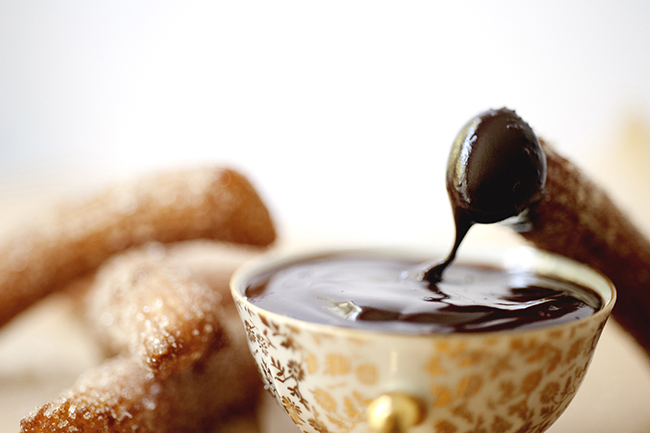 In Spain, they’re served with rich drinking chocolate, which is essentially melted chocolate with a touch of cream. 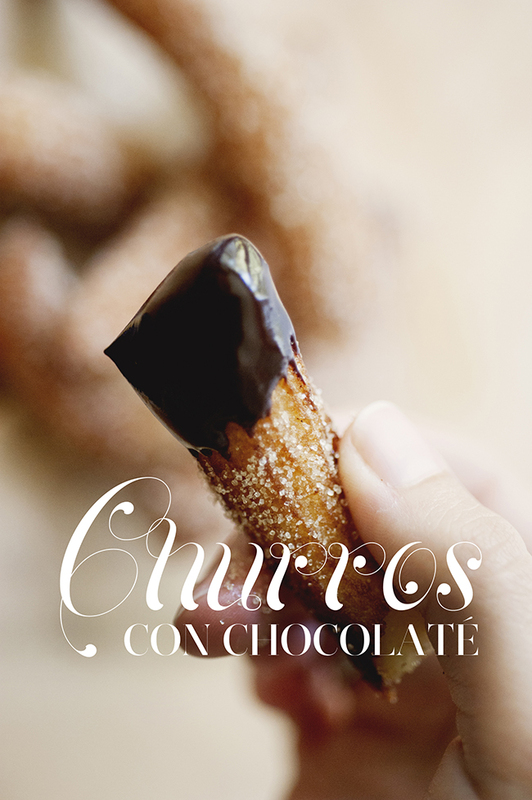 You dunk the churro into the chocolate, crumbs of cinnamon sugar accidentally swirling in, and get a gorgeous combination of textures and flavors. Crunchy, warm, sweet, a little gooey, it’s all so indulgent and delicious. 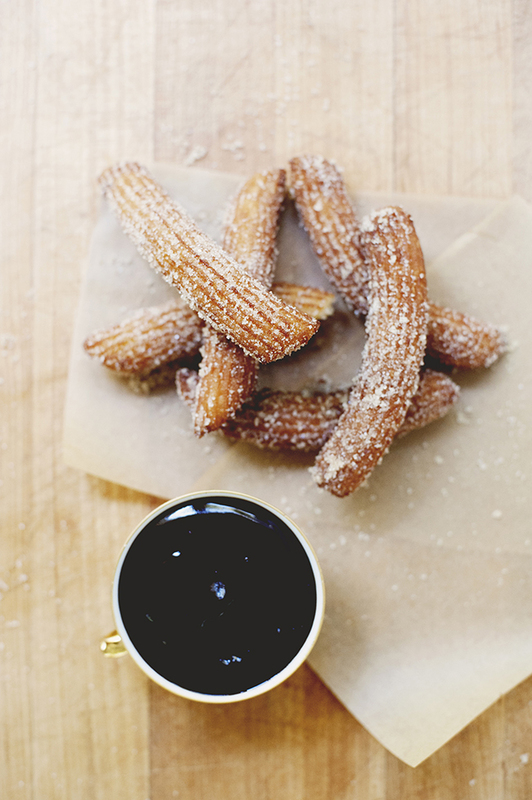 Anything fried can seem a bit intimidating, but churros could not be simpler. They’re essentially made with a choux, or, a partially cooked dough, and the key to their texture is mixing the dough while warm and using it immediately. Depending on the size of your pastry tip and how big you make your churros, the cooking time might vary, so give it a try and adjust to what works best for you. ¡Que aproveche! In a small saucepan over medium heat, combine water, sugar, salt, and butter. Bring to a boil and remove from heat. Immediately stir in flour and mix until it forms a ball. Heat oil for frying in deep-fryer or deep skillet to 375 degrees F. Pipe strips of dough into hot oil using a pastry bag. Fry until golden (about 10 minutes, constantly flipping); drain on paper towels. For dipping sauce, melt the chocolate over a double boiler and add the cream. Stir to combine. For a thinner sauce, add more cream.